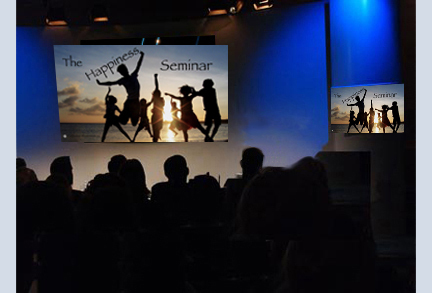 The Happiness Seminar is conducted by a licensed Psychologist and open to participants 18 years or older. What to expect - The Happiness Seminar takes place over three consecutive days: Friday evening, all day and evening Saturday, and most of Sunday. Participants will be taught various concepts and mental exercises aimed to bring an increased awareness to how they think, feel, and process information. The Happiness Seminar is not therapy - it is an educational experience that uses psychological principles designed for mentally healthy, dynamic individuals with the intention of increasing their quality of life. It is not for treating mental illness and does not deal with individual problems. Warning: The seminar entails long hours and should only be partaken by people who can tolerate sitting for a long period of time. Although breaks and stretches will be offered throughout, a person must be able to sustain sitting for long hours. It should be understood that the intension of these intensive hours is to create a personal momentum to foster a positive breakthrough experience. Individuals with a history/or believe themselves to have a mental illness are not allowed to participate in The Happiness Seminar. If you are experiencing a mental illness we recommend that you seek treatment from a qualified Psychologist or Psychiatrist.